Horse Chestnut, which goes by the Latin name Aesculus hippocastanum, is used widely in Europe to treat Chronic Venous Insufficiency, or CVI. Although it has purported uses for a variety of other conditions, CVI is the only one for which there is sound scientific evidence to back it up. Chronic Venous Vnsufficiency is a medical condition where the veins do not return blood from the legs to the heart in an efficient manner. This can cause all sorts of medical problems, including painful varicose veins, ankle swelling, intense itching in the legs, leg ulcers and leg cramping at night. Studies have shown that using the Horse Chestnut Seed Extract, or HCSE, to treat Chronic Venous Insufficiency has been beneficial in relieving many symptoms associated with this condition. There is no evidence to back up using other parts of the plant, such as the leaves or the bark. Interestingly, an extract made from HCSE is sometimes used to treat painful haemorrhoids as well as diarrhoea. Tests have been carried out on people and animals using HCSE, as well as in laboratories, with positive results. In particular, people who have CVI have reported benefits from taking the extract akin to wearing compression stockings. That means they have witnessed less swelling in the legs, decreased leg pain and itching, and fewer leg cramps. Dosage by mouth has been the most helpful, with gels having no effect. Intravenous use of HCSE has been associated with anaphylactic shock. People are warned not to make home-made tinctures or salves from the horse chestnut. Raw parts of the plant contain aesculin, which is poisonous to humans and many animals. The plant needs to be properly processed by a professional to be considered safe. 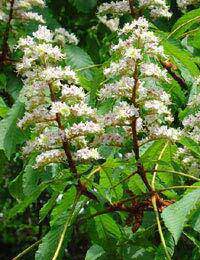 Also, people who have diabetes as well as children should avoid taking Horse Chestnut in any form, as there is a risk of decreased blood sugar when taking it. Those who are allergic to chestnuts, aesculin or any of the ingredients inherent in the manufacture of HCSE should avoid it entirely, as should children and those with renal or hepatic insufficiency. Monitoring is recommended for people with bleeding disorders as taking it may increase the risk of bleeding. As always, if you are considering using any herbal supplement of any kind, always talk with your GP first. Some supplements, even those which are natural, can interfere with other supplements, as well as with certain prescribed medications. Horse Chestnut trees can grow up to 60 feet tall, with a round or oblong crown. They produce creamy white flowers and each spiky fruit usually has up to three seeds inside. There are 15 native species of Horse Chestnut in Europe alone, and 10 in North American, where they sometimes go by the name “Buckeye”, as the seeds look like the eyes of a buck, or male deer. Some animals can eat the nuts without getting ill, such as squirrels and deer, but others can die from the aesculin inherent within. Honeybees, for example, have been known to die from toxic nectar made from some species of “Buckeyes”, while people have reportedly been known to poison fish by tossing crushed Horse Chestnut seeds into water to make them easy to capture.